My cat suffered a stroke today. I had test done and found out she is also a diabetic. Something I was not aware of, and something that no doubt lead to her stroke. Her veterinarian suggested her quality of life now is poor, and I should consider having her put down. Plus even if she was able to recover from her stroke I will have a lot of medical bills to treat her diabetes. Right now I'm at a loss of what to do. I live way below the poverty line, and I cannot afford to treat her diabetes. I want to do what is best to make sure my cat takes a fortunate rebirth. From what I have been taught euthanasia is frowned upon in Tibetan Buddhism. I was taught that if someone dies before they are supposed to they will only take that karma with them to their next life. Which will be short and painful. Please advice me on what is best for my cat. I would give her away if someone would be willing to take care of her, but not many people want a 14 year old cat that needs medical care. Do I allow her doctor to put her down? Or should I just let her diabetes take her life? This suffering is impermanent, fleeting. I should talk again with the vet, ask more vets their opinion. An organisation who cares truly for animals who can advice/help? davcuts wrote: My cat suffered a stroke today. I had test done and found out she is also a diabetic. Something I was not aware of, and something that no doubt lead to her stroke. Her veterinarian suggested her quality of life now is poor, and I should consider having her put down. Plus even if she was able to recover from her stroke I will have a lot of medical bills to treat her diabetes. Right now I'm at a loss of what to do. I live way below the poverty line, and I cannot afford to treat her diabetes. I want to do what is best to make sure my cat takes a fortunate rebirth. 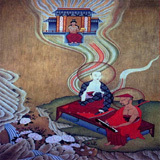 From what I have been taught euthanasia is frowned upon in Tibetan Buddhism. I was taught that if someone dies before they are supposed to they will only take that karma with them to their next life. Which will be short and painful. Please advice me on what is best for my cat. I would give her away if someone would be willing to take care of her, but not many people want a 14 year old cat that needs medical care. Do I allow her doctor to put her down? Or should I just let her diabetes take her life? One thing you can do is contact a cat rescue organization near you and discuss the possibility of them helping you find a situation where your cat's medical needs can be met. As far as when a being is "supposed" to die, that can be at any time and by any number of means, including by your own own hand. So, who can say? I, personally, have had to face the decision to put a suffering animal "out of it's misery". For times that I chose death, I have no regrets. If my decision means that I've accumulated seriously negavtive karma, then so be it. My personal feeling is that another being's suffering is a FAR more important concern than the favorability of my own rebirth. But let's be VERY clear. I'm not saying you should put the cat down. I'm also not saying shouldn't, either. This is a decision YOU have to make and you will have to abide by that decision regardless of the outcome. If I were you, I'd look into the cat rescue option before making any other decision. Lamas seem to agree on this point, --they are our Buddha-reference points. you are not at fault, you simply don't have the means, just try to treat it with diet or naturally..
Last edited by Adamantine on Thu Aug 04, 2011 6:33 am, edited 1 time in total.
" I cannot give an advice. You have to decide what is best. The ethical attitude in Buddhism is to avoid to harm others. Not harming others can be seen from different perspectives and you have to decide based on your own wisdom and compassion." That is not the answer I wanted, but it is the one I expected to get. All I want is what is best for my cat. If I let her be put down would that be what's best for her. That's a question I struggle with. If it means her next rebirth will be short and full of suffering then I can't see putting her down is the correct thing to do. If I just let her diabetes take her life it means I will continue to let her suffer in this life. Some might say needlessly, and accuse me of taking part in animal abuse. I don't want to force my religious beliefs on another, but my faith in Dharma makes me feel if I don't choose correctly, I may make my cat suffer more in her next life. I swear this is one of the worst decisions I have ever had to make. At the moment she is refusing to eat or drink, and because of her stroke her balance is so bad she can barely stand up. It seems it's just a matter of time, but do I end her suffering in this life by having her put down, or do I create more suffering in her next life by having her put down. I'll be honest I just wish the teacher I had contacted would tell me what to do. I don't trust my own wisdom that I will make the correct decision. Like I said I just want to do what is best for my cat. Either way my sweet, loving cat is going to suffer. davcuts wrote: Do I allow her doctor to put her down? This is probably the option that will be easiest for you, both financially and in terms of mental anguish. But it's probably not the best for the cat, because you're not allowing that karma to come to fruition. Or should I just let her diabetes take her life? This is definitely the more difficult option for you -- because you'd have to watch and comfort your cat during it's last days and that might not be very pretty. If you don't have the money to treat the diabetes you don't have the money. That's your karma and your cat's karma. But you can try and keep keep your cat as comfortable as you can for as long as you can. I'd say do what you have the ability to do, both financially and mentally. Ask your vet, but if you're feeding the kitty a grain-based diet, switching to a more normal-for-a-cat diet(think what she'd catch, like mice..) might help too. gnegirl wrote: Ask your vet, but if you're feeding the kitty a grain-based diet, switching to a more normal-for-a-cat diet(think what she'd catch, like mice..) might help too. There are some very nice no-grain no-gluten high protein cat foods out there that really aren't too expensive. Especially if you feed your cat a couple times a day instead of leaving a big bowl of food out -- many cat's are just as bad as portion control as many of us fat americans I use blue buffalo or science diet with my cat and he's slim and in very good shape for an old cat. I think a 20$ bag of blue buffalo will last my cat a month or two (if not more), and it's no-grain, no-gluten and 40-50%+ protein. Animals don't have our way of experiencing life and don't rationalize death as we do. We tend to have more fear and anxiety. I've been where you are for a few times. Once I spent near all my savings operation after operation to save one of my cats. It was of little use, as it died from the same problem (after 3 interventions, a leg amputated and so on and so forth - cancer was the problem). I had two cats then. After the first operation they couldn't be together any longer as they would fight fiercely (no matter the amount of techniques I've used to solve this). Imagine having the need of closing each door in your house and always being vigilant so they wouldn't even see each other. It wasn't easy. It was an eye opener too. My attachment to the cat lead me to prolong her suffering, making her endure one operation after another while perhaps I should just have been there for her till the end. Of course I thought I was doing the best for her, that leaving her to die was simply a way to rationalize not wanting to spend a little fortune without guarantees. She lived till the end as I didn't put her to death, but a lot of suffering was involved. Today I think I made a bad call. In the end I just didn't want her to die, which she did, probably bearing much more suffering than necessary. These days I think differently and already had to deal with similar situations. Animals tend to be quiet near death. We nee to be brave and endure, petting them if so is their wish until they die. It is painful, but I think that when there's very little chance of survival, it's the best we can do. Sometimes they die peacefully (with different degrees that we need to endure). If they feel we are there, it's like they feel protected and go through it a lot easier. When near the end, usually they lie down and slowly their functions stop. There are a few signs that may disturb us a little, but that's where being brave is important. Death seldom is easy or beautiful. But if we remain, having them in our minds and hearts and protect them the best we can, they can die in their environment with much less stress and probably have better chances of getting a more favorable rebirth. It's painful, but that's how I think we can be of more benefit. We all die. It's good to have someone who likes us supporting us when it happens. In my experience, pets also feel this way. Do your best to give her a comfortable life and be there for your cat when it ends. That's what I would do. I hope everything works out for the best. DN--Thank you for your compassionate, common-sense response. I wish I could say that it was representative of the messages on this board, but it was not at all typical. If I didn't know better, I'd think that so-called Buddhists might be inhabiting some strange, parallel reality. Prolonging an animal's or a person's passing with pointless interventions is simply cruel and ignorant. Having spent many years as an RN I've seen far too many families forcing the hospital staff to keep grandma or grandpa alive beyond their expiration date, resulting in terrible and unnecessary suffering, but always with the same outcome. I find that I agree with Silent Bob and DN. I too have been a pet owner for many years, having grown up with cats on the family farm and having almost always had at least one of my own in any place I lived. I've had to make this decision several times, and it never gets any easier. Now that I know the story of the Buddha making the decision to kill a passenger on a ferry because that man was going to kill the other passengers, and about his decision being an example of taking on negative karmic burden for a noble reason (saving the lives of others by taking that of one), I feel a bit better about having done what I did. That is not to say that any of my cats were going to become killers; rather, I take from it that my choosing to carry that burden, for having a suffering beloved pet (to whom I have always been attached--to every single one of them) euthanized, since my intention was to prevent a painful frightening death that decision is somewhat mitigated. It took me many years to be able to stay with my pet while the vet administered the drugs that would ease his/her passing. However, now that I have reached that point of being able to own my decision and be wholly present, holding my wonderful pet while his/her heart slows and then stops . . . listening to the cat purr right to the very end, lying calm in my arms, or watching the light go out of my dog's eyes as she slips away . . . I cannot regret having given them an easier passing. Quality of life, before quantity. just my opinion, worth what you paid for it. If you get killed, that is a result of your karma, regardless of manner. Is it not? If it is not the result of your karma to be killed, it won't happen. This applies also in the case of a cat being put down. Everyone is saying it interferes with the cat's karma. But how can a death occur for a being that is not a result of its own karma? From our point of view it just seems like we are interfering, but if this is not in the cat's karma, it won't happen. Or do we believe things happen to beings regardless of their past actions, for no reason they've caused? Who said only a natural death is a result of karma, and having your life ended by outside forces has nothing to do with you, but only that outside force? Of course though, that does not remove your decision to put the cat down. However the cat meets its fate, that is a result of its own karma. Whether that is good or bad karma for you I think is not so clear. It's the old topic of mercy killing, which can by no means be equal to or worse than killing out of hatred. So at least there is that. Starglade wrote: It took me many years to be able to stay with my pet while the vet administered the drugs that would ease his/her passing. However, now that I have reached that point of being able to own my decision and be wholly present, holding my wonderful pet while his/her heart slows and then stops . . . listening to the cat purr right to the very end, lying calm in my arms, or watching the light go out of my dog's eyes as she slips away . . .
the Lamas and not simply their own guesswork. will relieve their suffering is an assumption based on ignorance. it is clear that you don't. That is a nihilistic perspective, not a Buddhist one. these stories to justify our own killing out of ignorance. Yes, I agree. I also think I might have been misinterpreted. I never had an animal killed. Just did tons of surgeries to keep one of them alive. I believe should have let her (the cat) die because due to those operations she only suffered more. In the end exactly the same happened. I thought I was doing the best for her (couldn't live with the idea that I still had money and yet had let her die), but today I believe I was wrong. It would have been better for her, I think, not being subjected to such amount of interventions and simply dying more peacefully. In the end, she died exactly like that, in home with those who loved her present, but not before enduring a series of surgeries that probably only made it worse. I say stay there to the end while they die naturally. It may take a while and it's painful, but I think it is the best we can do. We stay there for them till the end, yet we don't have them killed. From then on, no more surgeries out of attachment. This is a very personal matter and I respect what people decide, knowing that first and foremost what goes in their hearts counts the most, but my stance is just enduring and caring till the end without artificially going through inhumane efforts to prolong suffering. If there's little chance, maybe it's best to let life end naturally while being a true friend. There are many ways to ease pain also, if we think suffering is too intense. Regarding this last point, there's some discussion. Is it better to die in complete agony with a perfectly unbalanced mental state or enter the bardo while having been drugged? This I don't know and I'm not sure if there's certainty about it. When my pets died, I just kept giving them, as prescribed, their medication. Pain killers (like tramadol) were usually part of it. Although painful for me to watch them die, I think they passed away with some tranquility and being there helped. They didn't seem in great distress, although in the end it's a bit hard as they don't always act very quietly (some do though and it's almost as if they fall asleep). Dechen Norbu wrote: There are many ways to ease pain also, if we think suffering is too intense. Regarding this last point, there's some discussion. Is it better to die in complete agony with a perfectly unbalanced mental state or enter the bardo while having been drugged? This I don't know and I'm not sure if there's certainty about it. When my pets died, I just kept giving them, as prescribed, their medication. Pain killers (like tramadol) were usually part of it. Although painful for me to watch them die, I think they passed away with some tranquility and being there helped. They didn't seem in great distress, although in the end it's a bit hard as they don't always act very quietly (some do though and it's almost as if they fall asleep). Regarding this last issue, Chokyi Nyima Rinpoche was asked in a Q&A whether potent analgesics would interfere with a dying parent's transition into the bardo. His answer was that while narcotics at the end of life might not be desirable in the case of a very accomplished practitioner, but that ordinary people are already quite confused when they're dying and that if drugs to ease their pain and fear are available, they should be used and not avoided. No, it's not. It's scientific fact that a dead body no longer feels the pain it felt when it was alive. That's all people are trying to end by having their pets put to sleep. It ends the current painful situation certainly. Is this the claim you are making? Like I said, this is the Tibetan Buddhist forum. The OP practices Vajrayana. So for those of us who do practice Vajrayana, that means we have Gurus, -Lamas that we trust to know things beyond ordinary sense perception and limitations of time -- similar to the story of Shakyamuni's prior lives. In regular terms, this is akin to trusting the reports of an astronaut about what he/she saw on the surface of another planet, or coasting through space: most of us don't have the resources or skills to find out for ourselves, so we trust a second or third party who through various tools we've discovered is authentically who they claim to be. Myself, and many others I am familiar with on this forum have had direct experiences with spiritual guides that clearly indicate that they have perception that is extraordinary. Faith is part of it too, -not blind belief- but confidence in the capabilities of the mind based on understanding sunyata and dependent origination among other topics of study, and rooted in direct experience of the mind's extraordinary capabilities both first and second hand. If you have a scientific materialist belief (certainly a type of faith based on no evidence) which is actually a form of nihilism-- then you are merely trolling the TB forum. As DKR puts it, the type of "faith" we are talking about in this context- - is similar to the faith you'd have if you put an egg in a pan of boiling water on a flaming stove: you'd have faith that the egg would hard-boil. Of course, obstructions may occur-- the wind may blow the flame out, someone may knock the pan over-- but barring these one has confidence that the egg will hard-boil. When one has met enough extraordinary masters, had direct experiences of their qualities, and studied the law of cause and effect-- then yes, one has a similar faith in realization as anyone who is familiar with boiled eggs has faith in the future of their own egg sitting in boiling water. And additionally, I have had experiences directly that clearly confirm for me that there is absolutely the continuation of the mind after the death of the body. So knowing this, the idea that killing a being will put them out of their embodied suffering is ridiculous-- the mind is what experiences the pain of the body, and the mind continues-- so why do you think there would be no more pain? The cause of pain is not the body. Unless you believe the nihilist idea that there is 'nothing' after death, which is logically untenable. As Bob Thurman likes to point out "there is no such thing as nothing". Dexing, karma is not fate-- it is not locked in and we are not all just following the script. There is free will, and there is karma too-- it is a very complex and intricate web, cause and effect, volitional action, dependent origination, collective karma and individual karma. 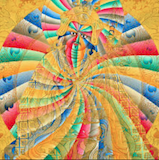 For anyone but a Bodhisattva it is merely guesswork to try and fathom it, although we have a rough knowledge that actions will lead to effects similar in nature, due to the kindness of Shakyamuni Buddha. Killing out of hatred is certainly worse than killing out of ignorance with a compassionate motivation. The action of intentional killing is still there though, and it will bear fruit-- but more importantly, what will happen then to the animal that has been killed? If you know about the bardo and the 6 realms, then you know that you may have just plunged your poor pet from the frying pan directly into the fire so to speak. It would be much better to use whatever little time they have left rather than cutting it short, to help them make a deeper connection to Dharma: regularly show them liberation upon sight objects, feed them sacred substances like dutsi-- chant mantras like Om Mani Padme Hum as you sit with them and send them love, bring them to visit a realized Lama if you know one nearby, circumambulate a stupa while holding them or walking them, watch Dalai Lama teachings on the TV or computer while you hold them, etc. etc. There are so many things you can do to help them in a more profound way than prematurely killing them, which may do much more harm than good.